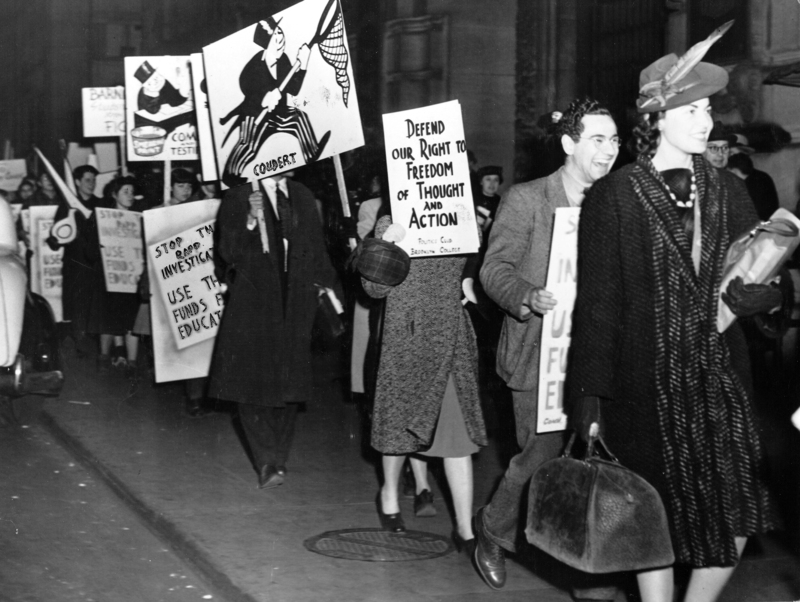 Taken during the Rapp-Coudert Committee hearings sometime between 1940 and 1942, this photograph shows demonstrators protesting against the statewide hunt for "subversive activities" and persons in New York's public schools and colleges. Supporters came from other colleges as indicated by one placard signed "Politics Club Brooklyn College." Holding private hearings from September 1940 through December 1941, the Rapp-Coudert Committee subpoenaed and interrogated more than 500 faculty, staff, and students, particularly those involved in any alleged Communist related organizations. City College, especially, became a target of the committee with dozens of faculty and staff called to public hearings and demanded to name names of other communist sympathizers in the school. By the close of the committee, more than fifty faculty and staff at CCNY were left without jobs after they were identified as communists by two friendly witnesses at the school. Cite This document | Unknown, “Rally against the Rapp-Coudert Committee: "Defend our Right to Freedom of Thought and Action",” CUNY Digital History Archive, accessed April 20, 2019, http://cdha.cuny.edu/items/show/3892.